***NOTE: Winners have been contacted by Email. Make sure to check yours – and look in your spam folder – so we can get you your prize if you won. Hey all, as promised: we hit 2000 followers on Twitter and so we’re giving away some games. And we thought, might as well give away the BEST games of 2014, right? 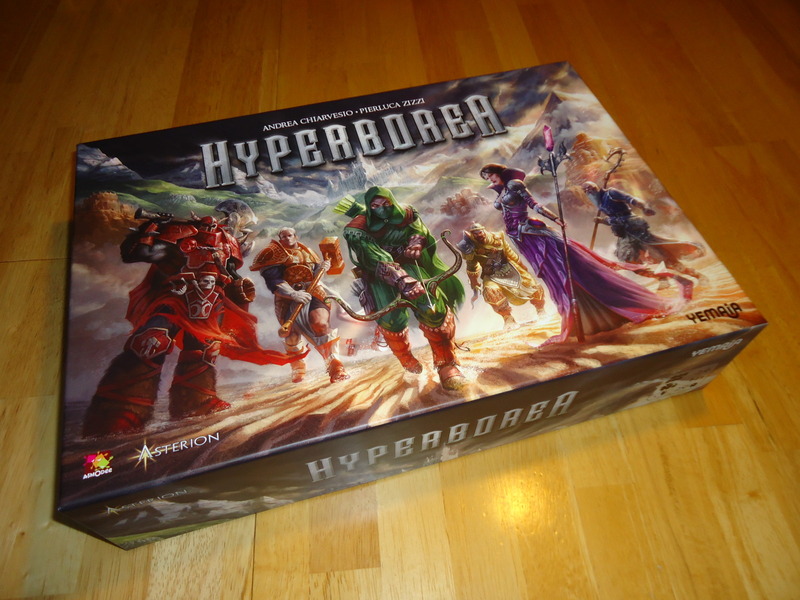 So we’ve got a first place prize of Hyperborea. And, we’ve got a second place prize of Castles of Mad King Ludwig. Two pretty fine prizes, amiright? ***Update: Thanks to Asmodee’s generousity, the 1st place winner will receive in addition to the game a set of promo cards. The promos include 4 new tech cards and a new “island” hex tile which I am a bit jealous of, if you know what I mean. ***Update 2: Guess what, we’re adding Fields of Arle as another prize. So we’ll pick 3 winners, yes we will. Thanks to Z-Man games for providing a giveaway copy. ***Update 3: We’re adding Villainous Vikings to the giveaway. That’s right 4 winners. Still not enough, you say? Well, we wanted to give away Quantum too, but it’s completely out of stock. How about Tokaido instead? Sure. We’ll add it in. Anyways, we’ll probably add more prizes if we can. Y’know if we were to hit, say, 2500 followers on twitter or get 500 mailing list subscribers. Just saying. Sharing is caring, people, sharing is caring. Anyways, you know you want those games. We’ll make it easy for you to enter with this rafflecopter thingamajig. The terms are in there, but a quick callout – as we’ve been doing, this giveaway IS open to our international readers, but in order to make that viable we can only cover the first $15 in shipping. If we can make it happen, we will. If you win and find out the shipping is too much, you can always back out honorably, or we’ll figure out something if we can. Best of luck to all of you knights. Dragon slayers. Dragon Knights! I don’t have a miniature game yet so this would be a great add to the collection. Add in the mind numbing, AP inducing, gameplay and it sounds like a deep game that I should have! My favorite board game right now (early in the hobby still and small in total collection) is LOTR LCG. not really a “board” game but the story, decision making and variety in adventure every time you play is very attractive. I would say it’s either Belfort or Escape: The Curse of the Temple. I love them both but for entirely different reasons. Belfort is an amazing worker placement/bidding/territory control game, and I think the taxes mechanic is amazing. Escape: The Curse of the Temple: best game to introduce new people to board games, and it’s infinitely scalable, so it’s always fresh. My current favorite board game is Russian Railroads. Who doesn’t like a good point salad? Robinson Crusoe because very time i play it it is something new and it tells a wonderful story. Sentinels of the Multiverse was my first love, and is still very dear to my heart. It’s exciting, incredibly thematic and every hero and villain feels different, distinct. There’s just so much to love! My favorite game of the moment is Ticket to Ride, which we acquired recently. I like it because it is very easy to teach to our ten year old daughter. I’m still obsessed with Claustrophobia, another great Asmodee (although under a different publisher now) game. Favorite Boardgame of all time? Cosmic Encounter. Not really close. I could go on and on about why it is but it really comes down to two things: Every game is different and no other game I own promotes those “stand up and cheer” moments in quite the same way. Favorite “new to me” game of 2014? Eldritch Horror. Man, I was not expecting to like this one as much as I do. Picked it up on a semi-whim and fell in love. My favorite board game is Mice and Mystics. Great dungeon crawl with awesome artwork and oozing with theme. Always a good time playing it. Also gets non board gamers to my table. I highly recommend it to anyone that like co-op games and also a great theme for people that have kids. Wow. That is a tough question. I would have to go with Five Tribes. I love how each game is different and have found it to be a great gateway game. Thanks for the contest! I would love to win either of these, especially as I promised my girl friend that I wouldn’t buy any games this year…winning games doesn’t mean the same as buying them, does it? I’m in the UK, if I won would the games be sent from the US or would someone purchase them locally and send them on? My favorite board game currently is probably 5 tribes. I like the fact is everygame is a different strategy to win. The mancala mechanic is very easy to teach and understand. Eldritch Horror is my current favorite game right now. My wife and I enjoy Seasons as we both play in different ways (I usually go by my gut, and she plans things out from the start) but it always seems to be a close game. My favorite game right now is Doomtown: Reloaded. And I don’t get to play it enough! But I’ll give second place to Sheriff of Nottingham, which not only is riotous fun, but because of it, I’ve managed to finally remember the correct way to spell “sheriff”, every time! …wait… sherrif… sherriff…. sharif…. UGGGGGHHHHHH. Mage Knight: It’s a complex thematic puzzle where every new ability you get feels overpowered. It’s super rewarding when you figure out how to beat a group of monsters that had previously seemed insurmountable. My favorite game is Republic of Rome. Coming in a close second is Ikusa, and thrid Civilization. In truth, I love all games! Favorite game right now is probably Splendor. Great game that is simple to play, hard to win against my wife, and plays quick enough I can challenge her to a rematch when I inevitably lose again. The Resistance: i like the social and deducing character of it. My absolute favorite is Go, but my favorite non-classic game is probably Twilight Imperium even though I’ve only played it once. The one I’ve played the most is Pandemic. Agricola is my favorite because it’s different every time. Cop-out — My favorite game is the one I’m playing at any given time. That’s actually true, I’m just pleased as punch to play any game. Agricola is the choice for me – worker placement, meaty decisions, creating combos, and at least I think a strong theme. Both of those sound just absolutely fantastic. I’ve been thinking that I need to pick up Castles of Mad King Ludwig for the family anyway! My favorite game is Suburbia because its cool and replayable. My favorite game right now is Dead of Winter. Definitely one of the more engaging games I’ve played. Our favourite game at the moment is Suburbia, we love creating something of our own and it’s one of those games where the process is more satisfying than winning! Can’t wait for the new expansion later this year. We’re also loving Sushi Go at the moment as our favourite quick game. Favorite game is a tough call. I like so many for so many different reasons. Caverna, viticulture, dead of winter, eminent domain. Etc. Right now my favorite is Sentinels of the Multiverse because my sons are playing it with me a lot – and that is what it is all about! Love 7 Wonders, but I have lots of “favorites”. Favorite game is Eclipse – love the 4x action. I don’t have a favorite board game, per se. I’ve got a favorite mechanic, and that’s deckbuilders. my favorite game is Lord’s of Waterdeep,because the game is very good,but mainly because i played D&d many years,and actually gamed in Waterdeep!!!! Letters from Whitechapel is my favorite game at the moment — I love hidden movement games and this game really kills it! My favorite game is Power Grid. The economics of the resource depletion is so fun, and I love the auction mechanism as well. It’s such a clean game and I’m probably going to buy the deluxe edition too! Currently it is probably City of Remnant by Plaid Hat. It’s a fun strategy game that combines a lot of different mechanics that shouldn’t work together but do. What an awesome contest. I want to win! Right now, I’m playing a lot of Star Realms and Mysterium. But I love so many games that I can’t find the time to play them all! Always changing. Antike would probably be the current one. I still like the rondel mechanic and no-luck are good, but it can still allow for interesting strategy changes. My current favorites are Istanbul and Sheriff of Nottingham. Did I win something yet!? I love Battlestar Galactica, ’cause it’s a great game and has tiny spaceships! My favorite game at the moment is Roll for the Galaxy. Really smart and a ton of dice rolling fun! My favourite board game at the moment is Lords of Waterdeep as I love the mechanics and the rich lore and history. Can’t wait to be the proud winner of your contest. My current favorite game is Settlers of Catan, because my son just got into it. Who would have figured? I only own Castles in this giveaway so I would love to win any of these. Thanks for the contest. I’d love to win either of these games – they both look interesting! My favorite game right now is too difficult to narrow down. So, I’m going to toss in X-Wing, City Hall, and Fief. My favorite board game is Small world because it plays well with all player counts and plays differently each time and has tons of different things going on each time you play it. I like Suburbia right now, so I might like the castles of mad king Ludwig as well! My Favourite board game is quite tough to choose. I love the Castle Ravenloft series from Wizards of the coast, Elder Sign, Pandemic and Zombicide for the co-operative aspect, all players working together to try and beat the game. Discussing and planning our strategies and options. I also love Shadfows over Camelot and Dead of Winter for the co-operative nature but with the fear that we may be helping a traitor or not, the never quite knowing until it’s too late. My favorite game right now is Caverna. Love the building and worker placement. So many fun options of things to do. My favorite game at the moment is Eclipse. It’s epic, but not so epic you can’t finish it in a few hours! I think, currently, it’s Keyflower. It just does everything it does so well. I like the clean bidding, and the open worker placement. I love the aesthetics. Eclipse. Glorious 4X with beautiful Euro underbelly. What’s not to love? My favorite game right now is Settlers of Catan… Just love the mix of a building game with strategy. Definitely a fan of pandemic – the mix of strategy and teamwork is done well. Oh I want this game so bad! I love a good strategy game, and fantasy is my favorite flavor! So at the risk of losing your respect! Pick me! Pick me! Please pick me! My current favourite is Battlestar Galactica. It’s the best of that kind of games which you recall matches from ages ago, all thanks to its traitor mechanic. It’s a shame you almost need exactly 5 players to get the best experience, but it’s really an amazing game. I love euros, but my favorite game will be allways AH Civilization. Hmmmm, at the moment I’d have to say Abyss. It’s gorgeous, plays fast, and has good depth with a small ruleset. It’s impossible to pick one favorite game for me, but I’ll go with Innovation right now. I think I’ve played it more than any other game I own and I’m not even close to being tired of it. Love the deckbuilding with a purpose@! Wow that’s a hard one. There are so many!! I feel like if I name just one my other games will get jealous. I guess I would have to say Monopoly…. ha just kidding. I would say firefly cause I’m a huge fan but Mage Knight, Runebound and Lords of Waterdeep are the ones I play most with friends. My current favorite is Lords of Waterdeep. Any other day I’d probably say ‘anything Matt Leacock’. Marvel legendary: who doesn’t love fighting the bad guys with cool super heroes? My favourite “board” game doesn’t have a board, does it count? 🙂 Dominion all the way! Favorite games right now are Flashpoint, for the run around, mayhem, building on fire theme, and Quantum because its so easy to learn but the depth of strategy is impressive! Kemet is my favourite game at the moment. Lots of battles, variety of powers, and great miniatures, can’t wait for the expansion. My favorite game is Agricola because it’s so cute! Currently, A Few Acres of Snow. Don’t get to play it much but I like the head to head historical gaming that my wife is still willing to try! My current favorite boardgame is Keyflower. I love the tense decisions around auctioning and working towards the endgame. I think my current favorite game is Viticulture/Tuscany. It looks and plays great, and it’s a game my wife definitely enjoys playing (she’s not a gamer). My favorite board game is Game of Thrones: Second Edition. Because it’s awesome. My favorite board game is Legendary: A Marvel Deck Building Game. Love because I’m a comic book fan, love Marvel, and collecting cards to build up characters abilities and fighting skills is awesome. Current favorite board game has to be Galaxy Trucker, fast and frantic, but still has strategic decisions to make once the frenzy is over. My favorite board game is a card game! Sentinels of the Multiverse! I have been changing my favorite as I find new ones. Stone Age just showed on TableTop and a friend got the game. We’ve been playing it with his nine year old son who gets sooo excited when he gets tools. It is a blast. My current favorite is 7 Wonders. I live how it is relatively easy to learn and teach, but even after countless plays it still feels like my group hasn’t mastered it. Definitely the Cryptzoic Cerberus Deck Builders right now. DC is fun for the family, but the LotR/Hobbit ones are a bit more interesting to me, theme-wise. Thanks for holding a great contest! I think Currently, my favorite is Five Tribes. Or maybe Abyss. Of course, X-wing is pretty great. And 7 wonders is classic. Ok, I have a lot of favorites. Arkham Horror, I love the HP Lovecraft Universe and the cooperative game mechanic. Every time a pleasure. Call me boring but Risk, however, it’s for a good reason. I’ve been playing that with my Dad since I was 4. Now that he’s heart transplant bound we play more than ever. Current favorite is Frag or Firefly, looking forward to XCom! Favorite, X-Wings. But Splendor and 7 Wonders close second/third. I love a lot of games. I have games for each moment and for every kind of people that comes to play with us. The most played are Descent, Dixit, Lord of the rings lcg, Netrunner, Claustrophobia, Seasons… oh my i love them all. Awesome contest guys! Keep being awesome!